As men’s spa-ing becomes more popular, spas are embracing their male clientele and created spaces ‘for him’. 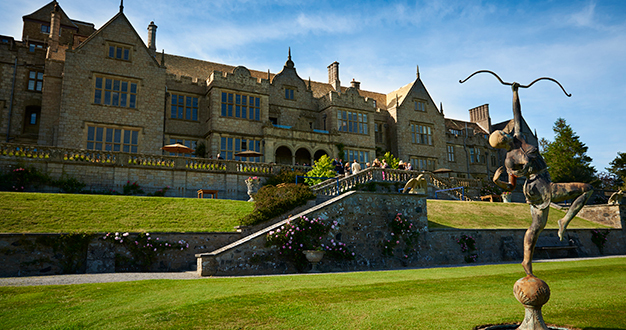 Shy Spy and The Man visited Bovey Castle to see how her alpha male would fare at the Gentleman’s Quarter. 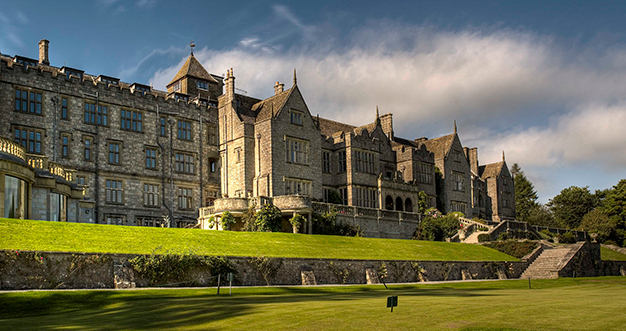 Bovey Castle is a country pursuit playground set in 275 acres of very British wilderness, with off-roading in Land Rover Defenders and quad-bikes, plus traditional hunting, shooting and fishing a plenty. The crenellated neo-Elizabethan Manor is jaw-droppingly huge and grand, especially after a lavish multi-million pound refurbishment. But it is far from precious. You can even bring your gun-dog (or lap dog) to stay upon request, and the grand entrance hall is casually scattered with wellies and wax jackets for the inappropriately dressed to borrow. A Jacobean style staircase makes a grand accent to the bedrooms, with ornate plaster ceilings and a good, era-spanning array of art. Despite the popularity – even during a mid-week afternoon the Champagne tea was fully booked – there was always a space, seat, sofa or even whole room to claim as one’s own. What is the Gentleman’s Quarter like? The Elan Spa is in the Orangery wing of the castle. There’s a striking 20-metre Art Deco swimming pool with a jacuzzi and steam room. Loungers face out on to the sun terrace with sweeping views over the River Bovey. The spa reception isn’t particularly girly, more elegantly decadent with leather couches, grey walls, chic art and mullioned windows looking over the rugged grounds. The Man did not balk at the first post. The Gentleman’s Quarter is in one of the spa’s five treatment rooms, decorated with putty coloured hues, and kitted out with a classic barber’s chair. The Gentlemen’s Deluxe Grooming Experience (150 minutes, £115) incorporates all the male grooming treats on offer, but kicks off with a traditional wet-shave. 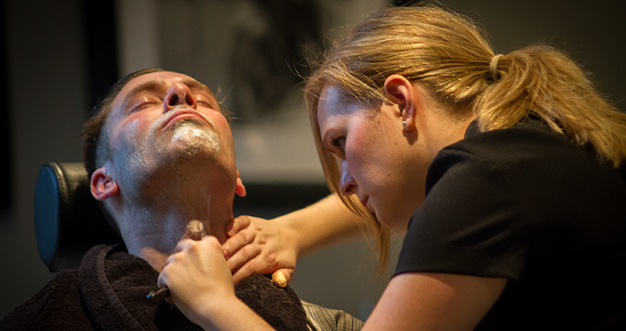 Going under the knife with a cut-throat razor calls for a degree of trust. Debbie, one of two therapists specially trained to deliver this treatment, made The Man feel like he was in safe hands. With hot towels and West Indian Limes Shaving Cream by the iconic brand Truefitt & Hill, the Man declared it one of the best shaves he’s ever experienced. De-whiskering was followed with a soothing men’s facial with ESPA Clarifying Skin Scrub, head, shoulder and face massage, and a gentlemen’s foot and hand tidy, followed with a splash of Truefitt & Hill Cologne. The Man emerged unscathed by the experience and bluffly admitted it was ‘very good’. I kept my observation about his glowing skin and general tidiness to myself, as I didn’t want to scare him. But he looked (and smelt) fabulous and was so much more relaxed which, given his job, is quite a feat. 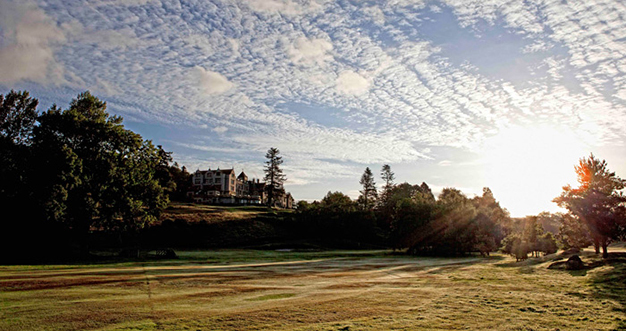 For the muscle-aching male golfer, the spa has created Golf Spa Treatments using golf balls – which you can also take home – to roll and penetrate deep seated tension. As mentioned The Man, is an obsessive fisherman – he hates the word angler – and ran down through the wiggly parts of the grounds to immediately recce the fishing lake stocked with Rainbow Trout. For when we return en famille, there are family lodges, daily egg collecting for the little ones, spa treatments for the teens and a chance to learn outdoor skills with the Bovey Rangers. Early evening was spent in the wood-panelled, tartan carpeted Oak Bar, an authentic nod to a bygone era. Lining the shelves are over 130 whiskeys, Dartmoor Ales and Havana cigars. Classic cocktails are expertly prepared by career barkeeps. Pre-dinner canapés arrived to whet the appetite for the seven-course tasting menu that lay ahead in the adjacent Great Western restaurant. There’s also the new Smiths Brasserie - named after WHS Smith, the stationery merchant, and original owner who brought Bovey in 1880. This is where spa day guests will eat, in robes if you wish although most opt to get dressed. The food is more contemporary gastro pub with plenty of healthy salads, too. The hotel and spa feel very unisex and the spa is very popular with male guests. It got the stamp of approval from The Man. We found what could have been quite a stuffy hotel to be incredibly welcoming – exactly what five star service is all about. You could just as easily pad about the place in wellies, thick woolly socks, a pair of brogues, or impractical sky-scraper Louboutins – although trainers at supper might be pushing the boundaries of good taste.